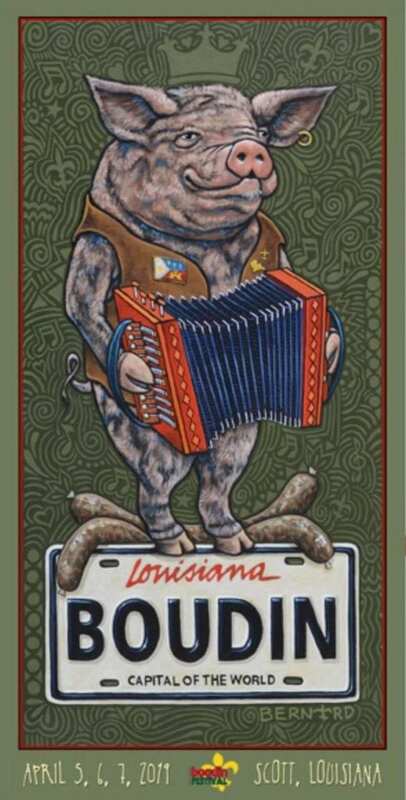 The 7th annual Scott Boudin Festival is April 5-7 on Lions Club Road in Scott, Louisiana. Scott is approximately 5 minutes west of Lafayette. The two cities have been locked in a death struggle for boudin primacy over the years with each camp having their acolytes as well as their naysayers. We have no dog in the fight. Our boudin coverage carries us far and wide across Acadiana from Bayou Lafourche to as far north as Marksville. Scott is the “boudin capital of Louisiana” but Lafayette boasts Johnson’s Boucaniere with Wallace Johnson holding down the grinder/extruder. His family brought the very concept of commercial boudin to Louisiana. If you go to Scott for the big boudin party please report back.